My posts have gotten pretty irregular, and they are going to stay that way for a little while. I’m trying to focus on getting more detailed research done and preparing for conferences and the like. I do need to learn to build a better balance between blog posts and in-depth research (such as shorter, less detailed posts) but I haven’t found that balance yet. I’ll get there. 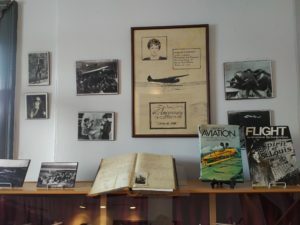 Yesterday I had the pleasure of visiting the Conception Bay Museum for the launch of the poetry book Flightpaths: The Lost Journals of Amelia Earhart by Heidi Greco. I snuggled in with the pirate Peter Easton and enjoyed an imagining through journal entries and poetry of Amelia Earhart’s last days. Peter Easton, a well-known pirate who often used Harbour Grace as his base. Photo by author. 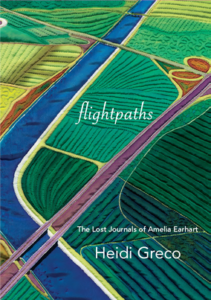 Greco fell in love with Earhart’s story, and has researched her life and the stories around her disappearance. She uses this information to follow what might have been Earhart’s thoughts as she and Fred Noonan find themselves crashed on a small sandbar, Noonan with severe injuries, and Earhart with a severely injured ankle. Greco allows Earhart to expresses herself with short journal entries, poems, and dreams, exploring her life from the first plane she ever spied, to her marriage to George Putnam, to her childhood and relationship with her sister, to her solo flight from Newfoundland, to her friendships with Katherine Hepburn and Eleanor Roosevelt. Through dreams the wanderings of the mind, Greco explores some of the theories as to what happened to Earhart as she attempted to fly around the equator. She looks at Earhart finding herself in a Japanese prison camp, in a witness relocation scenario, in an institution, and simply as an excuse for the United States to explore the Pacific Islands. Some of the poems and journal entries are so powerful that they will bring a tear to your eye and cause you to mourn the loss of Earhart. Heidi Greco reading from Flightpaths at the Conception Bay Museum. The camera insisted on focusing on the sunflower, brought by Greco as a reminder of Earhart’s Kansas. Photo by author. What made Greco’s launch even more powerful was that she choose to launch it in Harbour Grace on the anniversary of Amelia Earhart’s solo trans-Atlantic flight. 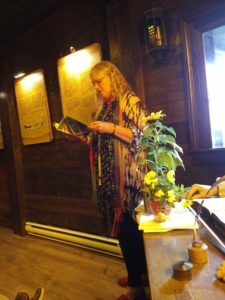 Most fitting, she read the poem “Grace” about that flight which even mentions “With a gifted thermos of homemade soup tucked beneath my arm,/ I ducked into the cockpit, smiling and waving”, a wonderful touch that I feel shows Newfoundland hospitality at its finest. Artifacts of aviation in Harbour Grace, including the log from the Harbour Grace Airfield. Photo by author. After the reading, it was wonderful to explore the museum. I have been there before, and will be there again. The museum showcases so many important parts of the area’s history, not just Earhart but the Harbour Grace airfield and Harbor Grace’s role in the Trans-Atlantic Air Race, the Kyle and its search for Old Glory. 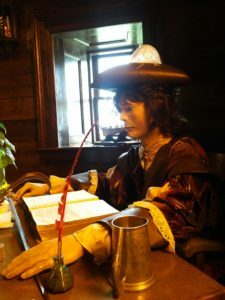 With so much history beyond aviation, the museum looks at the pirates in the area, the fishery, government, and life in Harbour Grace. 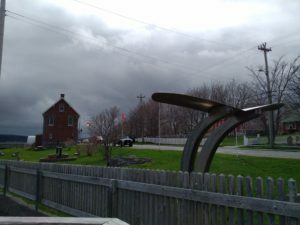 Outside the Conception Bay Museum in Harbour Grace. Photo by author. While at the book launch, I did have the oppotunity to meet many wonderful people from the area whom I only knew through facebook. First, the ladies of The Moose Curry Experience who post great recipes and have helped me with in the field identification with a tweet or two. I was also talking to Florence Button who runs the museums in Carbonear. I will admit I haven’t been into the Railway Station Museum, the Rorke Store or the Post Office Museum, but will make a point of visiting them the next time I am out in Carbonear (which is pretty regularly). Finally, I made arrangements with the wonderful folks at the Conception Bay Museum to let me check out some of their historic documents to get the research ball rolling on a history of Harbour Grace (one that might compliment Challenge of the Atlantic which is now out of print). 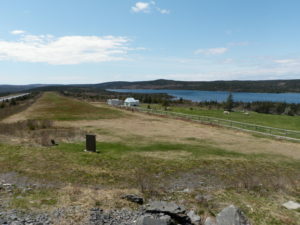 A picture of the Harbour Grace Airfield which was taken on a much sunnier day. Photo by author. Overall, it was a great day, and I enjoyed spending my evening with a glass of whiskey and a wonderful book of poetry.